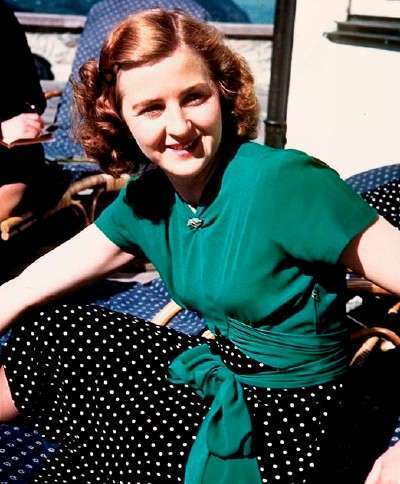 Born in Munich, Eva Braun was the second daughter of school teacher Friedrich "Fritz" Braun and Franziska "Fanny" Kronberger, who both came from respectable Bavarian Catholic families. Her elder sister Ilse was born in 1909 and her younger sister Margarete "Gretl" was born in 1915. Braun was educated at a lyceum, then for one year at a business school in a convent where she had average grades and a talent for athletics. She worked for several months as a receptionist at a medical office, then at age 17 took a job as an office and lab assistant and photographer's model for Heinrich Hoffmann, the official photographer for the Nazi Party. She met Hitler, 23 years her senior, at Hoffmann's studio of Munich in October 1929. He had been introduced to her as "Herr Wolff" (a childhood nickname he used during the 1920s for security purposes). She described him to friends as a "gentleman of a certain age with a funny moustache, a light-coloured English overcoat, and carrying a big felt hat." He appreciated her eye colour, which was said to be close to his mother's. Her family was strongly against the relationship and little is known about it during the first two years. 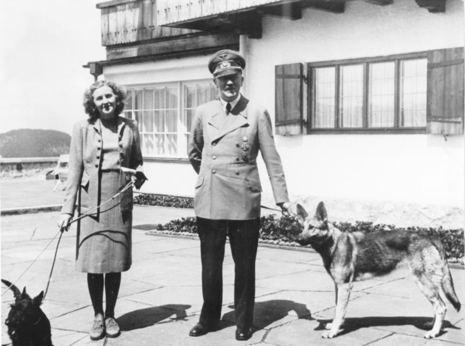 Fresh out of convent school Eva Braun met Adolf Hitler the first time when she was working as the assistant of Hitler's personal photographer Hoffmann. A few weeks after this meeting she agreed to follow the Führer to his mountain retreat in the alps. Their attraction was immediate, and over the objection of her parents, she became his mistress. For the next sixteen years, she lived in luxury as millions suffered and died at the hands of her 'Wulf'. In 1936 she finally moved to Hitler's Berghof at Berchtesgaden where she acted as his hostess. 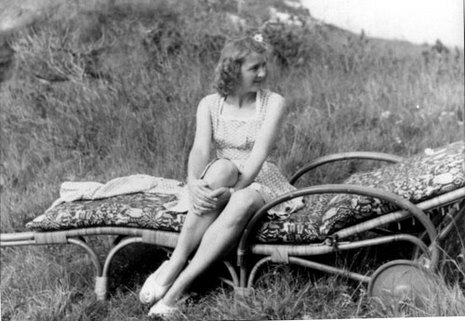 Reserved, indifferent to politics and keeping her distance from most of the Führer's intimates, Eva Braun led a completely isolated life in the Führer's Alpine retreat and later in Berlin. They rarely appeared in public together and few Germans even knew of her existence.